Home > Market News > OPEC Announces 800 kbpd Cuts – Is It Enough? OPEC Announces 800 kbpd Cuts – Is It Enough? Markets took a hard beating yesterday as they feared a lack of consensus during the OPEC meeting. Crude fell $1.40 throughout the day, but this morning has reversed course and is on track to close at its highest level since before Thanksgiving. Crude oil is currently trading at $53.81, up $2.32 (+4.5%) from yesterday’s close. Fuel prices are strongly in the black this morning despite posted inventory builds. Diesel is once again within striking distance of $2.00 – down from $2.40 just a couple months ago but above the $1.80 low. 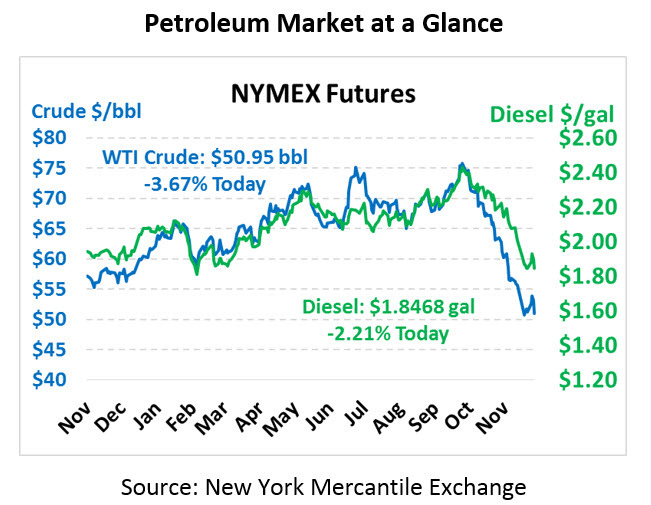 The diesel contract is trading at $1.9426, a gain of 8.4 cents (+4.5%) this morning. Gasoline, pushing above $1.50, is currently trading at $1.5191, up 7.6 cents for a 5.3% gain. OPEC has made significant progress towards completing a deal, after waffling yesterday. Headlines overnight included announcements such as “OPEC Talks Deadlocked” and “Risk of no OPEC Deal – It’s Real.” This morning news sources are citing official sources saying OPEC will cut 800 kbpd in 2019 – a bit over half of market expectations around 1.3 MMbpd. The group is expecting an additional 400 kbpd in cuts from non-OPEC deal members (half of that from Russia), bringing the total cuts more in line with expectations. Although less than expected, the cuts should help balance markets in 2019. The EIA’s last energy outlook report projected a net 2019 oversupply of roughly 600 kbpd. 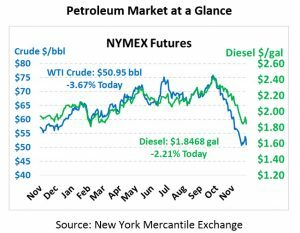 OPEC’s cuts will more than make up the difference to put markets into balance – or even slightly undersupplied – which will keep prices closer to the $65-$75 range, rather than $50, next year. The EIA reported a very large surprise draw in crude oil, while the fuel builds came in less than the API expected. Although bullish in appearance, the mechanics behind the report seemed less exciting. Crude exports reached an all-time high of 3.2 MMbpd, up 750 kbpd from last week, while imports fell by almost 1 MMbpd from last week. Imports and exports tend to be very volatile, so a one-week jump or dip tends to get smoothed out over time – meaning the large crude draw should be considered a one-off fluke, possibly setting the stage for a larger build next week.